Equality Florida is the largest civil rights organization dedicated to securing full equality for Florida's lesbian, gay, bisexual, transgender, and queer (LGBTQ) community. Why is Equality Florida important? Watch this video to find out. An Equality Florida representative staffs a table at the annual Harvey Milk Festival in Sarasota. 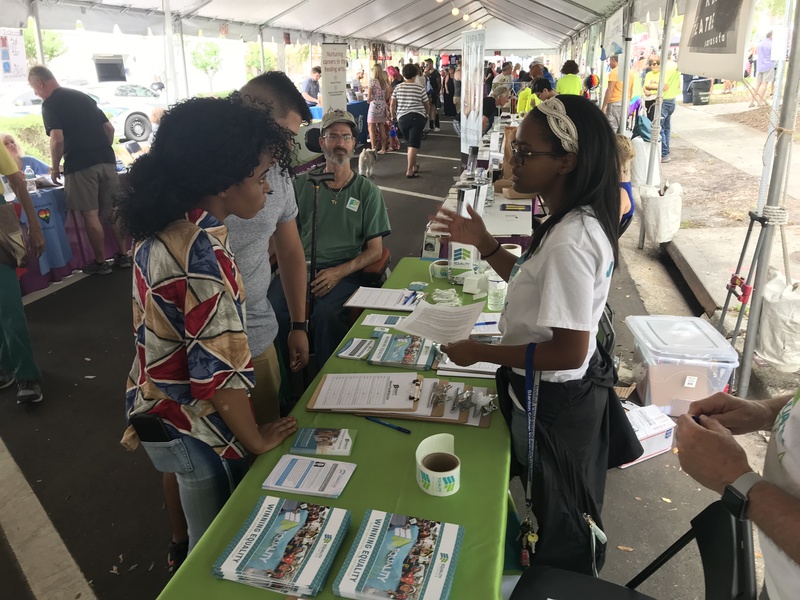 Equality Florida staff and volunteers attend events throughout the state to educate people about the organization's work. The Safe and Healthy Schools program aims to transform entire school systems by ensuring that they invest in and take full responsibility for meeting the needs of LGBTQ (Lesbian, Gay, Bisexual, Transgender, and Queer) students. We work with school districts to implement professionally recognized best practices, including protocols, policies, and programs that a school system must implement in order to ensure the safety and well-being of LGBTQ students. We provide the technical support school districts need to implement LGBTQ student support services, and we serve as the go-to conflict resolution resource by assisting the district in responding to the growing number of crisis calls from LGBTQ students and their parents. Counter the bullying, harassment, social isolation and bigotry that dramatically increase risk factors for LGBTQ youth, and create a culture of inclusion, respect, and understanding in M-DCPS. The Safe and Healthy Schools Program aims to transform the entire school system by providing the resources and expertise necessary to ensure that the school district itself invests in and takes full responsibility for meeting the needs of LGBTQ students. A critical component of this work is the convening and engagement of our Miami-Dade LGBTQ Youth Agency coalition: EQFLI, The Alliance for GLBT Youth, Pridelines, Yes Institute, Lotus House, Jewish Community Services, Safe Schools, and Miami-Dade County Public Schools. We are entering the eighth year of an ambitious LGBTQ equality-focused campaign to improve Florida's national and international reputation as a welcoming and inclusive place to live, work and visit. The program has grown exponentially in the past two years in particular and now includes over 80 of Florida's largest employers who have embraced LGBT-inclusive policies and make the case for LGBT protections statewide. We have now launched a program aimed at smaller companies that have also taken a public stand in support of LGBT nondiscrimination protections. In 2014, Equality Florida Institute launched TransAction Florida, a statewide initiative, led by our full-time Transgender Inclusion Director and a dynamic, diverse, statewide Advisory Board. TransAction was created to increase awareness, educate, and promote complete equality for the transgender community. Through this program, Equality Florida is uniquely positioned to counter anti-trans scare tactics with supportive messages from business, community, and faith-based leaders. The HIV Criminalization Reform Project is a statewide Public Education Campaign that seeks to transform public opinion.This project informs residents of the danger and injustice of Florida’s HIV criminal laws, emphasizing how laws disincentivize people from seeking testing and treatment, culminating in a skyrocketing number of new HIV transmissions, and a public health crisis. More new HIV transmissions occur in Florida than in any other state: rates of new transmission cases in FL have continued to increase since 2012, while the rest of the country’s HIV transmission rates decrease. In FL, failing to inform a sexual partner of positive HIV status is a 3rd degree felony offense, punishable by up to 5 years in prison and a $5,000 fine per count; multiple offenses may be ruled as 1st degree felonies. This law is applied irrespective of malicious intent or actual transmission. Long term, EQFLI expects this project to: *Increase incentive, especially among marginalized groups, to undergo HIV testing, thereby increasing opportunities for accurate diagnosis/treatment. *Reduce disincentive among these same groups; disincentive is a natural reaction to the real and perceived risk of prosecution and punitive consequences such as exorbitant fines, felony convictions, and years of jail time. *Change public perception of HIV decriminalization through education, and teach residents about negative health consequences and injustice of HIV criminalization laws.